What are tariffs and why are they important to U.S. citizens? Tariffs are key components of trade, especially international trade. Most American consumers’ merchandise, especially fast-moving consumer goods (FMCG) may be purchased from other countries to use in our households and workplaces. 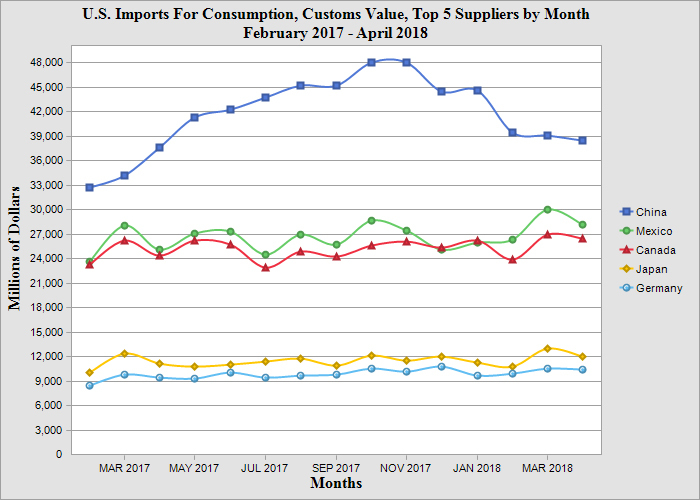 These consumer goods for American citizens must follow the Harmonized Tariff Schedule of the United States for imports from other countries to America. These tariff schedules are monitored by the U.S. International Trade Commission. Imports and exports often impact the economic balance to a country’s revenues, operating expenses, and fiscal policies. The Harmonized Tariff Schedule of the United States (HTSUS) is the primary resource for determining applicable tariff rates and statistical categories for all merchandise imported into the United States. It can also be used in place of Schedule B for classifying goods exported from the United States to foreign countries. The U.S. Harmonized Tariff Schedule (HTS) classifies a good based on its name, use, and/or the material used in its construction and assigns it a ten-digit number. There are over 17,000 unique ten-digit HTS classification code numbers. The Harmonized Tariff Schedule is based on the International Harmonized Commodity Coding and Classification System established by the World Customs Organization (WCO). Virtually all countries base their tariff schedules on the WCO’s Harmonized System. The Harmonized Tariff Schedules of the United States are available as a print subscription product or CD-ROM format. Custom Brokers will need to be familiar with the nomenclature found within these tariff schedules for the custom brokers’ licensure exam. Economists, political scientists, small, medium-sized, and large businesses’ senior management executives will want to be familiar with these schedules to identify growth markets and work with their trade compliance teams to ensure that their organization is properly classifying their merchandise. About the author: This week’s blog contributor is Maureen Whelan, Senior Marketing Team Leader for GPO’s Publications and Information Sales program office in Washington, DC. Maureen oversees print and digital content dissemination strategy and manages third party free and paid content distribution through platforms and vendors, such as Apple iBookstore, Barnesandnoble.com, Google Play eBookstore, Ebscohost databases, Overdrive, ProQuest, and more. Smartphones Make Traveling Easy and Fun! Smartphones are becoming essential for people who travel. But how do you find the best travel app for you? Whether you are a sophisticated or a new adapter of smartphones, the recently released publication “Smartphone Applications to Influence Travel Choices” published by the U.S. Department of Transportation’s Federal Highway Administration offers up the information foundation to let you maximize the value of this new technology. Are you a user of business-to-consumer apps, a mobility tracker, bike sharing believer, or are you interested in public transit apps or real time apps? Who can’t use a ridesharing or taxi-hail app, a smart park or courier network service? Get the picture? If you are a “mover or shaker” then smartphone applications are a must, and keeping apprised of the latest and greatest new technological features and applications is key to your daily survival. And for the newly initiated as well, the booklet, “Smartphone Applications to Influence Travel Choices” is the easiest way to take an information leap forward. Published since 1894, the GPO Style Manual is issued under the authority of section 1105 of title 44 of the U.S. Code by the Director of the GPO. The Manual is prepared by the GPO Style Board as a guide to the style and form of Federal Government publishing. The GPO Style Manual has become a major reference source for professionals involved in the field of Federal printing and publishing. Designed to achieve uniform word and type treatment and economy of word use in the form and style of Government printing, the Manual has become to be widely recognized by writers and editors within and outside the Federal Government as one of the most useful resources in the editorial arsenal. Writers and editors accustomed to utilizing style differences from those found in the GPO Style Manual will appreciate the difficulty of establishing a single standard. Users of the Manual should consider it as a general guide, for the printed word assumes many shapes and variations in final presentation. You can order the Style Manual 2016 in paperback and hardback versions. HOW DO I OBTAIN THE GPO STYLE MANUAL 2016? If you’re a small or medium-sized business—start-up, mature, or somewhere in between—and you’re looking to expand your international market share and bottom line, there’s a U.S. Government guide that breaks down the basics of exporting. U.S. companies are exporting more than ever before. According to the ITA, “in 2013, more than 300,000 small and medium-sized U.S. companies exported to at least one international market.” That has a lot to do with the fact that 96 percent of the world’s consumers exist outside of the U.S. Now is a great time for U.S. companies to go global. This U.S. Commercial Service resource provides U.S. companies, especially first-time exporters, with in-depth advice and real-life success stories. 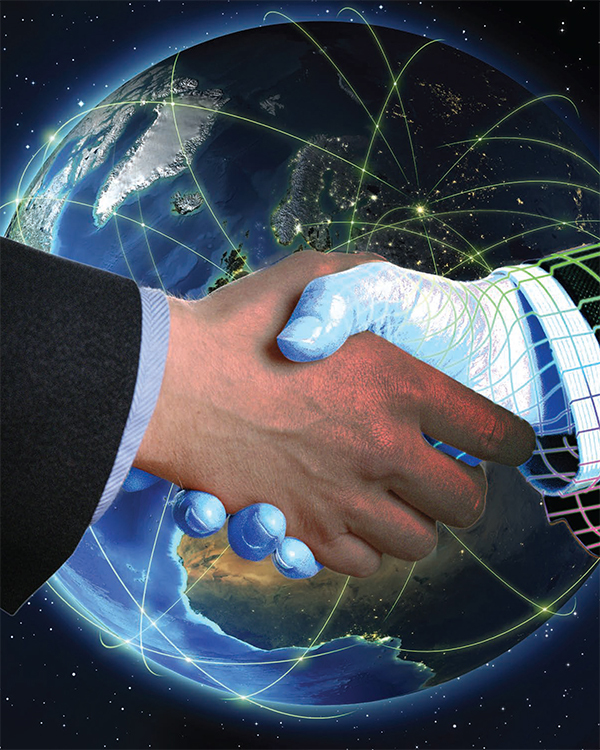 It deals with complex issues head-on and “challenges…assumptions about engaging in the world of international business.” In addition to A Basic Guide to Exporting, the U.S. Commercial Service offers trade counseling, market intelligence, commercial diplomacy and help connecting with potential international partners—a sort of business matchmaking service. Yes, exporting abroad is tremendously more complicated than selling domestically. But thanks to official U.S. government resources and services, the process is easier than ever before. The world is truly open for U.S. business! HOW DO I OBTAIN THIS PUBLICATION? The last week of February is National Entrepreneurship Week. Entrepreneurs are a mainstay of the American economy. By many estimates, the U.S. is home to nearly 30 million of them. Now, more than ever, the enticement of competitive advantage abroad is driving their business expansion plans. The global marketplace is truly open for American business! For companies looking to expand their international consumer base, the U.S. Department of Commerce, U.S. Commercial Service has two publications for your must-read list. 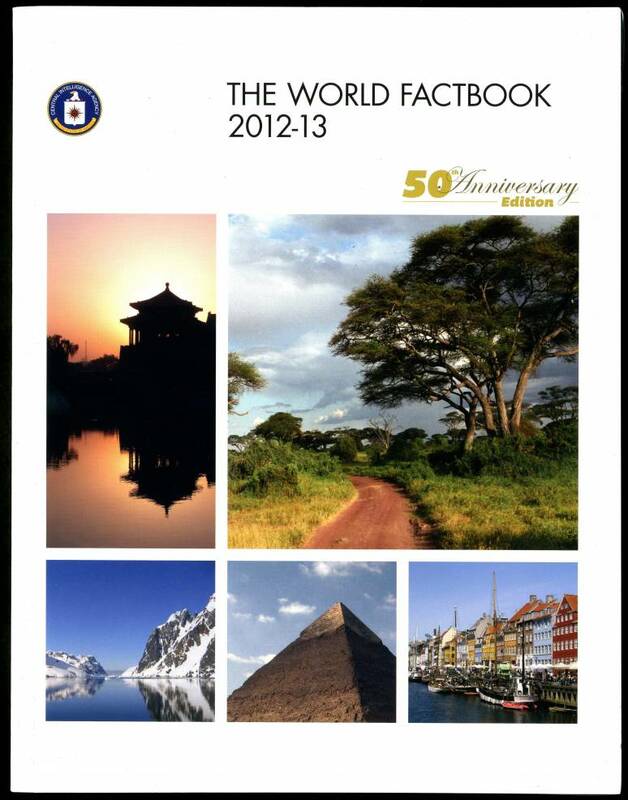 This fact book promotes lucrative opportunities in all 20 nations, especially in high-growth emerging economies. Each country section includes insights on market entry strategy, leading sectors, investment climate, and business customs. You can really nerd out with the cool geo-economic facts that abound. For example, Korea is the 7th largest export partner with the U.S. and the U.S. supplies over 50 percent of Honduran imports. Full-page conversations with Senior Commercial Officers at each U.S. Embassy are an anecdotal compliment to the economic analysis. For any U.S. company hankering to use FTAs to generate new business, this is the actionable resource for you. 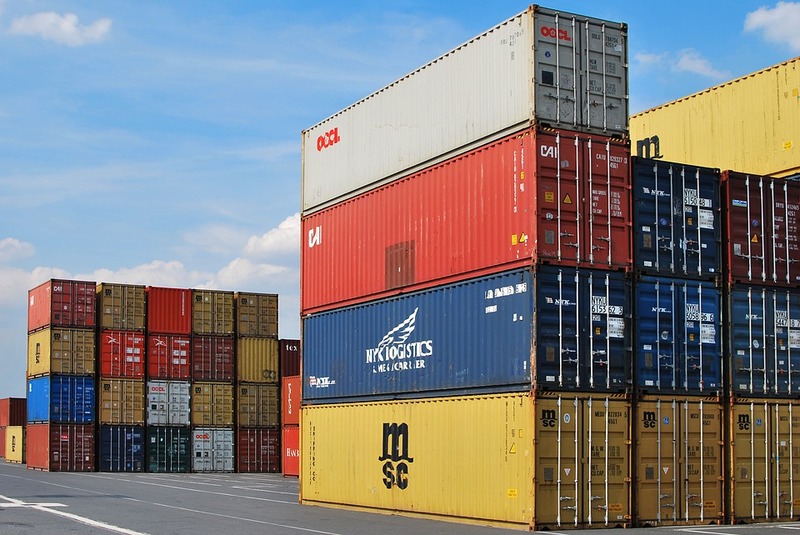 Start packing those shipping containers, exporters! Here’s an eBook with an unambiguous title and lots of global market-connecting real talk. As a top exporter, the U.S. prioritizes export promotion policies that make it easier for companies to sell worldwide. Yet only a scant percentage of small-sized businesses actually export their products and services. This publication offers testimonials from ordinary businesspeople who have survived—and profitably thrived—in the “exporting ecosystem.” Their oral histories express lessons learned in international client relations, U.S. manufactural advantages, removing fear of competition, and using U.S. government assistance programs. One company exec who oversees international marketing for a water-free urinal absorption technology tells the tale of launching international sales. A Nebraska-based leader in nonmedical senior citizen care discusses franchisee experience in Asia. And the Chief Marketing Officer of a prefab fiberglass dome manufacturer shares a vision of expanding into rural, developing markets. The stories are frank, enlightening, and ripe for small business growth applications. They demonstrate that it is possible to work with U.S. government agencies to grow an export business. From the perspective of both publications, it’s plain to see that focusing on U.S. small business exports is good government and good business. Order by Phone: Call our Customer Contact Center Monday through Friday, 8 am to 4:30 pm Eastern (except US Federal holidays). From US and Canada, call toll-free 1.866.512.1800. DC or International customers call +1.202.512.1800. About the author: Our guest blogger is Chelsea Milko, Public Relations Specialist in GPO’s Public Relations Office. Did you know that the U.S. Government offers more than 2,200 Federal assistance programs to the American public? It does, and these programs serve a variety of purposes and provide a range of benefits to state and local governments, non-profit organizations, institutions, and individuals. The one characteristic shared by these Federal assistance programs is their goal of supporting the American public. The benefits available through these programs include, but are not limited to, financial assistance and the exchange of property or services. With so many Federal assistance programs and services available, it can be understandably difficult to keep track of them all or know where to start when looking for assistance. That’s where the Catalog of Federal Domestic Assistance — known fondly as the CFDA– comes into play! The General Services Administration maintains a database of all of these programs and publishes a comprehensive guide to the programs annually. The 2013 Catalog of Federal Domestic Assistance assists users in identifying programs that meet their needs and obtaining general information about the program-such as how to apply for assistance, the approval process, related programs, and contact information. 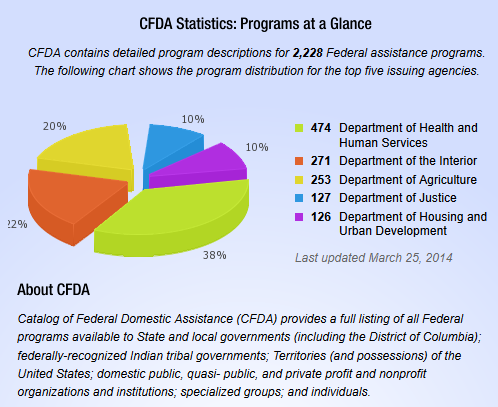 What categories of U.S. Government Federal Assistance Programs are there and what information is provided on each? Some types of Federal Assistance funding are issued via grants. To search for, apply to, and track all sorts of Federal Government grants, visit the Grants.gov website. Each program is detailed in the CFDA, and potential users can review the details including each program’s Objectives, Types of Assistance, and the rules for applying for and using this program, including Uses and Use Restriction and Eligibility Requirements for both the grant applicant and beneficiary(ies). Each entry also includes any Credentials/Documentation required and the Application and Award Process that must be followed to apply for , from Preapplication Coordination and Application Procedures to Award Procedure and Deadlines for submitting your application (if required). Types of Federal assistance programs run the gamut from Formula or Project Grants to Cooperative Agreements; Direct Payments for either a specified or unrestricted use; Direct Loans or Guaranteed / Insured Loans; Insurance; Sale, exchange, or donation of Federal property or goods; Use of Federal property, facilities, or equipment; even Investigation of complaints and Advisory Services and Counseling; plus many more. As you can see, Federal assistance programs exist to benefit the American public in many different arenas and through a variety of methods. Whether the goal is to reduce veterans’ homelessness, to mitigate the impact of earthquakes, or to provide mentorship for young people, the 2013 Catalog of Federal Domestic Assistance is the ultimate resource and all-in-one guide for learning about the programs that are available from the U.S. Government. After all, the public needs to be aware of these programs in order to take advantage of what they have to offer! How can I get these and other Federal Government publications on Federal Benefits? Buy the just released Catalog of Federal Domestic Assistance. Shop all our Federal Benefits & Entitlement Programs publications. Shop all our Veterans Benefits & Health Issues publications. Shop our Doing Business with the Government collection. Librarians: You can find the records for most Federal titles in the Catalog of U.S. Government Publications (CGP), or search for published U.S. Government eBooks in GPO’s Federal Depository Library Program’s special eBooks at GPO page. Visit a Public Library: Ask your local public librarian about Federal books in their collection as well as Federal eBooks that may be available for library patrons to check out electronically. About the Authors: Guest blogger Stephanie Jaeger is Sales & Marketing Coordinator for GPO’s Sales & Marketing Division that markets GPO’s publishing services to the Federal sector. Government Book Talk Editor Michele Bartram is Promotions and Ecommerce Manager for GPO’s Publication and Information Sales Division in Washington, DC, and is responsible for online and offline marketing of the US Government Online Bookstore (http://bookstore.gpo.gov) and promoting Federal government content to the public. Ahhh…. It’s that time of the year again: Awards season! From the Golden Globes to the Academy Awards, red carpets abound with interviews of movie stars and other celebrities boasting about their best work during the past year. We at the US Government Bookstore want to make sure our star publications and Federal agency publishers get their moment in the limelight, too. So, we are pleased to announce the winning publications that you, our readers, chose through your purchases over the past year: The US Government Bookstore Best Sellers of 2013! Americans love our national parks, so it’s no surprise the National Park System Wall Map Poster was a big hit. Humanities is a bimonthly magazine published by the National Endowment for the Humanities (NEH) which covers NEH sponsored research in the humanities and NEH programs and projects, as well as information on recent and upcoming NEH grants. With the 150th anniversary and reenactment of the Battle of Gettysburg last summer, The Gettysburg Campaign, June-July 1863 was a smash success (Read our post “Gettysburg, America’s Bloodiest Battle” for more information). the FREE digital version of The Warren Commission Report: The Official Report on the Assassination of President John F. Kennedy in honor of the 50th anniversary of President Kennedy’s assassination (Read our post: “Remembering Camelot: Best of the old and new official publications about John F. Kennedy”). Finally, the Statistical Abstract of the United States, the last official edition published in 2012 by the U.S. Census Bureau, contains a standardized summary of all official key statistics on the social, political, and economic organization of the United States (Read our post: “Statistical Abstract and Print Mashups in a Digital Age”). I won’t be going out on a limb to say that our customers definitely wanted to hug trees this year, as books about Trees & Forests topped the lists. Why Would Anyone Cut a Tree Down? and The Little Acorn are extremely popular books for children explaining about the uses and life cycle of trees. How to Prune Trees and How To Recognize Hazardous Defects in Trees for amateur and professional gardeners, landscapers and foresters alike, and the Timber Management Field Book serves as the most popular reference handbook for forestry professionals. International business entrepreneurs and would-be exporters have made A Basic Guide to Exporting: The Official Government Resource for Small and Medium-Sized Businesses a best-seller every year (Read our posts: “Exporting Made Simple” and “Government eBooks Made Easy– and Sometimes Free” for more information). Protecting intellectual property and privacy were extremely hot topics in 2013, making the Copyright Law of the United States and Related Laws and the Overview of the Privacy Act of 1974, 2012 Edition (extremely popular last year (Read our post: “The Privacy Act: What the Government Can Collect and Disclose about You” for more information). 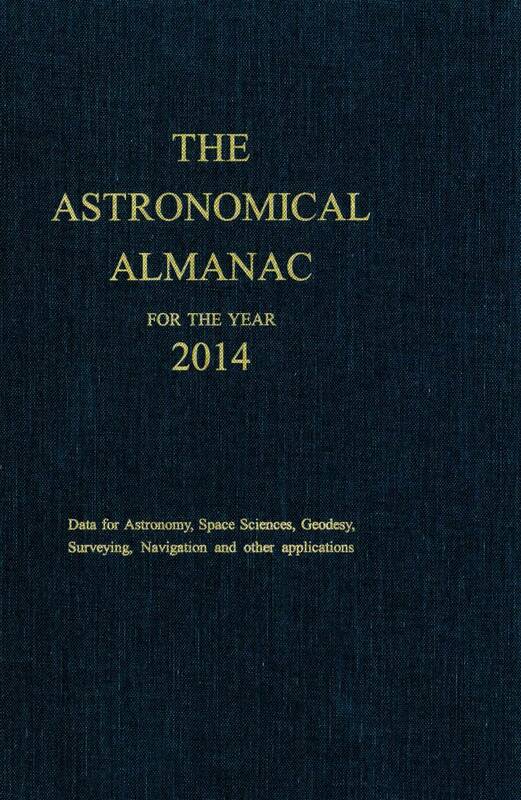 T he latest versions of the annual best-selling Astronomical Almanac for the Year 2014 (Combined Print plus Online Edition) and The Nautical Almanac for the Year 2014 are critical tools to aid commercial and private navigation by both air or water (Read our post: “Navigating by the Moon, Planets, and Stars” for more information). Specifically for maritime navigation, Navigation Rules, International-Inland contains the latest international regulations for preventing collisions at sea as well as the U.S. Inland Navigation Rules which have been in effect for all inland waters, including the Great Lakes. The FAA Safety Briefing magazine provides updates on major Federal Aviation Administration rule changes and proposed changes, as well as refresher information on flight rules, maintenance air worthiness, avionics, accident analysis, and other aviation topics. Civics and Citizenship Toolkit which contains all-in-one tools, including DVDs and an audio CD; study guides and planning resources; Civics flash cards and books . Vocabulary Flash Cards for the New Naturalization Test. Another patriotic publication that proved popular (Do you like the alliteration? :-) was Our Flag, which briefly describes the history of the American flag and sets forth the practices and observances appropriate to the display of Old Glory, was a top-seller. The Congressional book, How Our Laws Are Made, provides citizens with a basic outline of the numerous steps of our Federal law-making process from the source of an idea for a legislative proposal through to its publication as a statute and becoming the “law of the land”. Que Hay en Su Plato? : Mi Plato (Choose My Plate Poster, Spanish Language edition) healthy-eating poster for medical offices, schools, libraries or home. Healthcare professionals turned often to the U.S. Government Bookstore for Physician References & Medical Handbooks, Medical & Health Research, and Military & Emergency Medicine publications in 2013. Top on the list were copies of the new Healthcare Law, as well as the Special Operations Forces Medical Handbook. But also important were publications used to improve the quality of healthcare research and patient care and safety. These included the ORI: Introduction to the Responsible Conduct of Research (also available in Packages of 50) which provides guidelines for Public Health Service-funded researchers, as well as the TeamSTEPPS patient care and safety training materials for healthcare personnel, such as the TeamSTEPPS Instructor Guide (Binder Kit) and TeamSTEPPS Pocket Guide that should be handed out to all healthcare personnel who attend TeamSTEPPS training. the Defense Support of Civil Authorities (DSCA) Handbook. This last item is a two-in one resource that includes both the Tactical Commanders and Staff Toolkit plus the Liaison Officer Toolkit, and enables military tactical level Commanders and their Staffs to properly plan and execute assigned Defense Support of Civil Authorities (DSCA) missions for all hazard operations, excluding HAZMAT, CBRNE, or terrorist acts. The importance of radio communications was underscored by the popularity of the United States Frequency Allocations: The Radio Spectrum Chart (Poster) of all assigned frequencies and the National Interoperability Field Operations Guide which contains radio guidelines for establishing or repairing emergency communications in a disaster area. Every year, the publications containing the President’s proposed Federal Budget for the upcoming fiscal year are on our best sellers list, and the Fiscal Year 2014 Budget publications followed this tradition. (Note: Stay tuned! The new Fiscal Year 2015 Budget publications will be coming out soon from the White House). The U.S. Government Manual, the ultimate handbook of all Federal agencies, was a hit as it is every year. Now you can get the new edition: United States Government Manual 2013 (Read about it on our Blog post: “Understand How the U.S. Government is Organized”). the GPO Style Manual: An official guide to the form and style of Federal Government printing – also available on CD-ROM (Read our post: “Fun With the GPO Style Manual” for more information). How can I get these “Best-selling Books of 2013”? Shop Online: You can purchase these publications from the U.S. Government Online Bookstore at http://bookstore.gpo.gov by clicking on the individual links above in this blog post. You may also click here to shop our entire “Best Sellers of 2013” collection. About the Author: Government Book Talk Editor Michele Bartram is also Promotions and Ecommerce Manager for GPO’s Publication and Information Sales Division in Washington, DC, and is responsible for online and offline marketing of the US Government Online Bookstore (http://bookstore.gpo.gov) and promoting Federal government content to the public. Assistance provided by Stephanie Jaeger, Sales & Marketing Coordinator for GPO’s Sales & Marketing Division that markets GPO’s publishing services to the Federal sector.